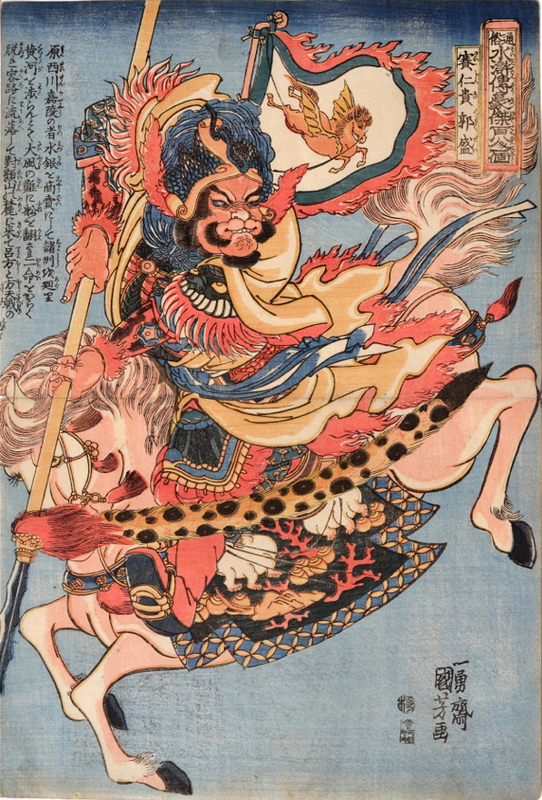 Utagawa Kuniyoshi (1797-1861) The 108 Heroes of the Popular Suikoden: Saijinki Kwakusei, Armed with a Spear on a Plunging Horse, 1827-1830. Oban. A fantastic print, bursting with energy… bursting also with questions and puzzles like so many of the prints in this astonishing series of individual masterpieces. The series represents individual figures from stories of the semi-historical Chinese novel, Suikoden (Shuihu zhuan in Chinese). The narrative tells of the adventures of a band of 108 rebels who sought refuge in the margins of Liangshan Marsh. These rebel warriors sought to protect the poor and downtrodden, very much like Robin Hood’s band of outcasts in medieval England. They were eventually to win both favour and pardon for heroically defending the country from invasion. As with so much ukiyo-e, the story itself is apocryphal, the characters are invented wholly or else dramatically embroidered and it is the ‘idea’ of the series and its astonishing and inventive power that carries Kuniyoshi’s vision. Japan was, even as early as the 1820’s, aware that it was living on borrowed time. The hermetic, enclosed, feudal culture of the centuries old shogunate was decadent and crumbling. The Japanese people were well aware of the world beyond their shores and the ruling samurai class were a dilettante excess that the new merchant class were openly resentful of. This series of apparently innocuous fantasy portraits was an important reminder of past glories and of the importance of personal honour. Saijinki - a giant, and seemingly the size of a horse - plunges towards the lower left of the print. The horse itself, seems to have galloped from the Italian High Renaissance via the stylus of a Dutch engraver, for it owes little or nothing to the traditions of Japanese illustration. 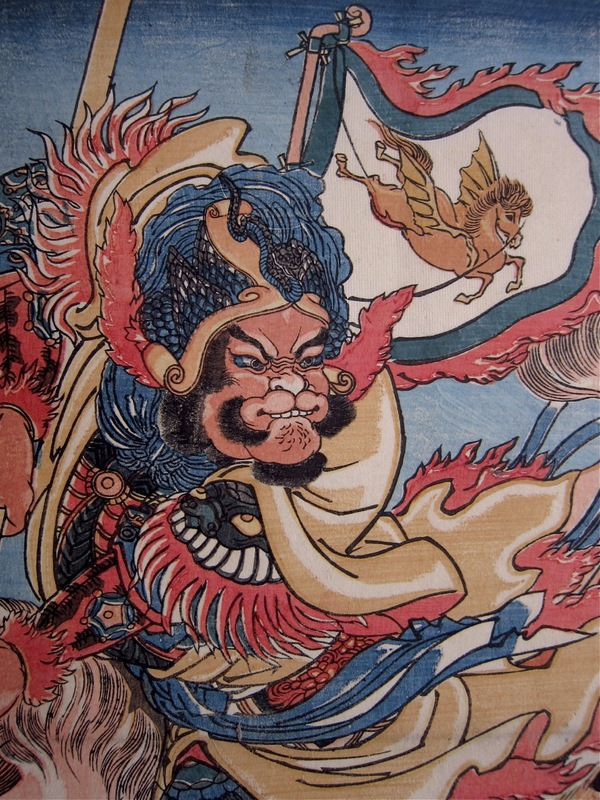 Imagery bursts from every line and motif - the fluttering pennant (again, western in design), with its motif of Pegasus; the grimacing Chinese dragon on the armour; the coral and sea shells of the saddle blanket; the leopard skin of the spear tassel and the orange flames that seem to engulf horse and rider… all of it speaks of an artist plundering every reference he can lay his hands on in order to realise the energy and other-worldliness of the subject. The result is a triumph… the print, with its boundless energy, leaps like the horse from the flimsy sheet of mulberry paper. Like the preceding prints on this page, this piece confirms the majesty of this groundbreaking work. Colour, and impression are fine, the condition is very good and unusually, trimming to the sheet and cartouche are minimal.